I like to attend farm shows. I specialize in research and development in ag-technology and I attend these shows as a means to substantiate the products I’ve helped develop. The vendors at these shows hope to affect the crucial decisions made by growers for the following growing seasons. Since I’m familiar with ag-biotech in early business development stages, I like to understand the adaption cycle of products and see how much interest there is in new technology. Recently I attended the Southern Farm Show in Raleigh to see what was new in biostimulants. 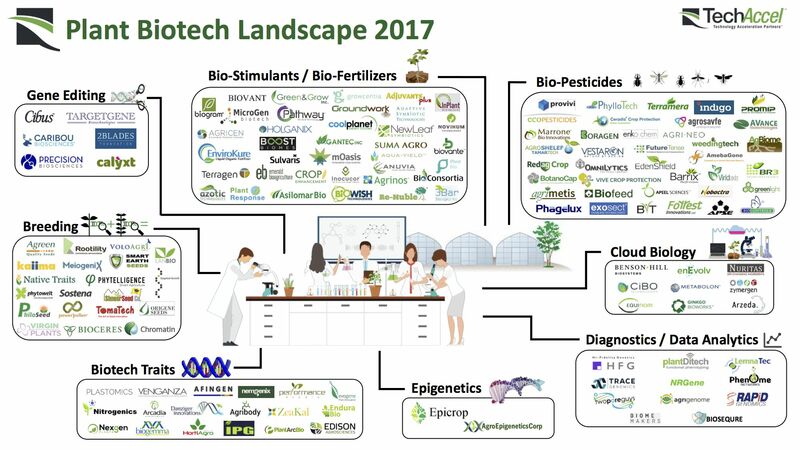 My interest had been piqued by an ag-biotech landscape map on AgFunder News that highlighted the many players in the biostimulant space. Biostimulants are broadly classified as natural compounds or microbes, but not directly fertilizers such as nitrogen or phosphorus, that can be used during crop cultivation to enhance growth. This definition is broad! The map showed at least 37 companies in the biostimulant/biofertilizer category and an equal number in the bioprotectant space. With this much competition, I expected to be overwhelmed by biostimulant exhibitors at the show. But I wasn’t. Of the approximately 400 exhibitors, only 20 or so fell into the biostimulant definition. Nevertheless, I spoke to all of them, and asked them the same three questions: Why do they think there is a profusion of activity in the biostimulants space? What would drive a farmer to consider these products? Do biostimulants work? Why are there so many biostimulant companies? “Never let a plant have a bad day.” These words of wisdom from a crop advisor at the show may be obvious yet also point to the many weakness of a plant’s physiology that biostimulants could address. A plant in the field needs a boost to improve nutrient uptake and needs protection from stresses including weather, insects and pathogens. It’s no wonder that the “biostimulant” concept includes so many different product types: microbial products include growth-promoting bacteria, non-pathogenic fungi, protozoa and nematodes, while the non-microbial group contains anything from seaweed extracts, humic substances, anti-transpirants, and complex organic substances (here is a link to a short review on the many classes of biostimulants). There have been companies thriving in this space for generations and companies just getting into the game today. Driven by the low cost of genomic sequencing, a key discovery tool in this field, microbial biostimulants are getting more attention since the multinationals such as BASF, Bayer, Monsanto-BioAg and FMC started microbial product divisions. Smaller companies are taking advantage of this interest: as the multinationals decrease their R&D spending, there are opportunities for smaller, agile companies to fill the R&D void with their own products, both microbial and non-microbial. All companies are gambling that because these biostimulants fall largely outside of EPA approval processes, traversing the regulatory path to market for will be faster than GMO or chemical products. A faster approval process would drive down product development costs to the obvious benefit of small companies. However, the regulatory pathway for biostimulants in the U.S. is still in the early stage, which has resulted ambiguous product claims (see “Do they work?” below and a brief white paper on the regulatory status of biostimulants on the BPIA website). Many of the biostimulant compounds fall into the “Generally Recognized As Safe” FDA regulatory category, hence providing both a halo effect and identifiable niche in the organic market. Ultimately, there is a great deal of plant and soil biology knowledge that has yet to be applied to a huge number of plant health problems. Hormonal biology, transporters, symbioses and complex mixtures of these physiologies create a lot of opportunity for new discoveries. Why would a farmer consider using biostimulants? Exhibitors at the biostimulant displays at the Southern Farm show were not terribly busy. This gave me the opportunity to have many in-depth conversations with them about the state of the biostimulant market. The market for biostimulants has been larger in Europe in the last decade, primarily due to European Union being notably clearer about definitions and regulations. Additionally, all components of the European food production chain accept biostimulants. In the U.S., the recent driver of alternative crop improvement methods has been consumer demand for more sustainable food production, a demand is just recently moving up the value chain to the producers. Yes, no, and maybe. Although low regulatory costs make biostimulants cheaper to bring to market, field trials are still too expensive for many small companies. As a result, much of the proof for product efficacy comes from greenhouse trials. While greenhouse trials are a great springboard for field trial design, greenhouse data alone is not convincing enough to invest in a product at field scale. I also learned from the exhibitors that while the regulatory path might be cheaper for biostimulants, it has the paradoxical effect of inhibiting the collection of data for good products that show additional benefits, such as protection from pathogens. Once a product is identified to be a biopesticide, it will need additional expensive data gathering to be registered with the EPA. The scientist in me is also frustrated by the efficacy data presentation in much of the product literature: the lack of error bars renders some of the displays essentially useless. Yet the biostimulant market is growing and existing companies are having continued success with fruit and vegetable growers. These are exciting times in agriculture; there are many, new, small companies with unique business models, investing in large discovery programs and field trial data. I’m sure that next year when I attend the Southern Farm Show, I will no longer have the opportunity to speak with the biostimulant exhibitors. They’ll be too busy talking to the customers who are ready to give biostimulants a try. You’re a GMO scientist? I should push you off this dock right now! Wow. Those were some harsh words coming from my new acquaintance at a social event. Her assertion made the hair stand up on the back of my neck even as I smiled pleasantly back at her. Luckily I’ve come to know that when I experience this kind of flight-or-fight response to a conversation about my work that it might turn out to be an opportunity to reduce the too often overheated rhetoric on the genetic engineering topic by engaging in a more personal conversation. My education as a scientist did not include any training in being able to discuss and describe my work with the non-scientific public. However, in the past 15 years, due to an increase in confirmation bias in part brought on by social media, the rhetoric around science, and my field of plant science in particular, has heated up. I dreaded social encounters where the unnerving question, “What do you do?” was asked, until I grew tired of being evasive about the science I cared about. Companies are now offering training for their employees in conversing about science with the public, and gratifyingly, many scientists are also sharing experiences and tips. Rather that enumerate those tips here, I thought it might be instructive to walk through the conversation I had with my dockside friend. It sounds like you have a strong opinion about genetically engineered food. What do you know? My first response was to ask an open-ended question. Emotionally, I really wanted to be reactive to her comment and to defend my experience with data. However, I’ve learned that people hold their beliefs sacred. If I simply contradicted my acquaintance, she would feel threatened, close her mind, and the conversation would end. I needed to spend some time appreciating her point of view. While digging deeper into an opinion that you don’t share may sound scary, asking such an open-ended question is a good way to calm yourself while focusing on the person you are speaking with. All those insecticide toxins in GMO seeds make food dangerous! This assertion helped me understand at least one aspect of her worries about genetically engineered crops. Strong assertions provide an opportunity to exercise a concept I learned from a leading science communicator, Kevin Folta, called “intellectual charity”: Extend the argument of the person you are talking to. This technique engenders trust in your listener. If I want her to understand me, I have to understand her first. I see why you would be worried about that. If insecticides are unsafe, why would we want them in our food? As I asked that question, I could tell by her face she was now open to listening to me. I asked her if she knew that the insecticide in genetically engineered plants is only dangerous to insects. Then I used one of my favorite analogies that I learned from the Genetic Literacy Project: think about the safety of this chemical as you would about chocolate—chocolate is toxic to dogs but not toxic to humans; in the same way, Bt is toxic to insects, but not to humans. I could have talked a lot more about the molecular mechanism of the insecticidal Bt proteins she was worried about or the numerous regulatory studies done on genetically engineered crops before they are released, but my aim was to cultivate trust, not to overwhelm with facts. At the end of the our conversation, I knew I hadn’t changed her mind about genetically engineered foods. Yet we didn’t walk away from each other angry; we weren’t polarized, because we had developed a shared connection. Today we are friends and have talked about food choices since then many times. Gratifyingly, she has also sought me out to understand science-based policy. In a social conversation about science, you only have a limited time to create a positive impact. Use that time in the most effective way possible. cSusanne is an independent consultant with over 20 years managing innovative teams in the ag-biotech industry.